Woah, woah, woah. I hate to break up the celebratory conga around the office but we have things to do. I know that you and your team are excited about the great candidate that just accepted your job offer. It felt, at times, that you would never find the right person for this job, didn’t it? But you did. She’s great. And you can finally stop worrying about it. Well, almost. You have some work to do first. Don’t worry, it’s not hard but it could be critically important. Let me ask you a question. Would you propose to your partner and then not speak to them until the wedding day? Unlikely. How about when you offer someone a job? Do you speak to them again before the first day? Sure, HR will have been in touch with the candidate to make the offer and negotiate the deal. But when did you, her new manager, last speak to her? The final interview? It always takes longer than you hope. Internal approvals, paperwork, negotiations and notice period. It could easily be two months or more before she is in your reception on her first day in her new shoes and nervous smile. That’s a long time. But she was so keen! 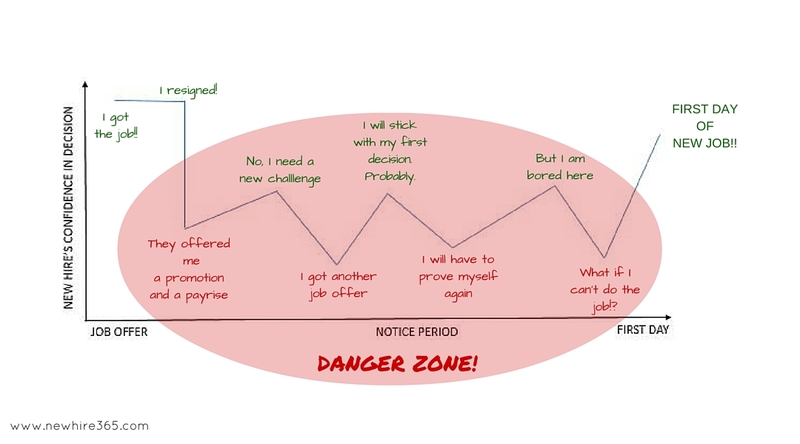 What could happen in those weeks between job offer and first day? A LOT! And you need to be a key player right in the middle of it. This is very often a nasty wake up call for your candidate’s current boss. If he doesn’t want to lose her, he will fight hard to keep her. Depending on her motivation to leave, this could be dangerous. A pay rise or a promotion could be enough to make her stay. It is a safe choice. She knows the people, she doesn’t have to prove herself again. Better the devil you know? She never said she was exclusive to you. Of course, a candidate of this calibre would have had other interviews and peaked the interests of other smart leaders. 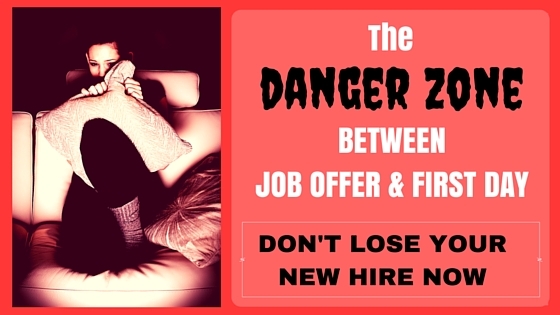 The one thing harder than losing a candidate to a counter offer is losing a candidate when you didn’t even have the opportunity to fight for her. You might not have that chance if you are not in the game. This is a major decision she is making. We have all been there. Some days it feels like the best decision ever. On other days, you start picking holes in your own judgement. It is amazing how easy it is to talk yourself out of something amazing because you listen to the wrong voices in your head. Practical: Will the extra 30 minute commute be worth it? Will it be frowned upon if you ask to work from home if your son is sick? Will you have to work long hours to get up to speed? Social: Will you get on with your new manager? What if you don’t like the rest of the team? What if they don’t like you? You will miss the people you are working with now. Capability: Can you really do this job? You will have to prove yourself all over again. What if the job isn’t what you are expecting it to be? So how do you get her safely through this gauntlet? You need to be right there in the game. How do you do that? It is good old fashioned, (seems too obvious to say but we clearly don’t do it enough) communication. Be in contact at least once a week between your new hire accepting the job offer and their first day with you. The most important thing you can do is to pick up the phone and talk to them. They would have been in contact with HR but it is you, their manager, who they want to speak to. A day or two after they have accepted the offer: Tell them how delighted you are that they are joining. Ask them if they have any questions, if there is anything you could provide them with to make the transition easier? Tell them you are planning for their first day and will be in contact with them soon to give them more details. A couple of weeks later: Talk them through the plan for the first day, who they are meeting with, the objectives for the day, what time they should arrive, what the dress code is. A week before they start: Call them again to talk them through the first few weeks. This is particularly important if you are making plans for their onboarding that will involve travelling to a different site or putting in some longer days. If dates are flexible, check in that the ones you are thinking about don’t clash with a family/personal commitment. Send them their business cards. Their name and new job title next to the company logo is a really powerful image. Invite them out to lunch or drinks with the team. HR paperwork so they don’t get bogged down with this all on their first day. An introductory email/phone call from the person you have lined up to be their ‘go to’ support person to help them through the first few weeks. Now, don’t get me wrong. Not everyone you offer a job to is a flight risk. There will be many that already have the ‘farewell dear colleagues’ email in their draft folder. (We have all had jobs like that, right!) But all these efforts above are never wasted. Isn’t it flattering to know that people are excited about working with you, that they are spending time talking about you and planning on how to make this decision a great one for you and the company.